Chains, necklaces, lockets and bracelets. Wedding bands and rings with or without diamonds. High school and college class rings and award rings. Pendants, charms, cufflinks, brooches and pins. Earrings – unmatched or a complete pair. The condition of your jewelry doesn't matter. We'll happily buy your gold, silver or platinum even if it's tarnished or broken. 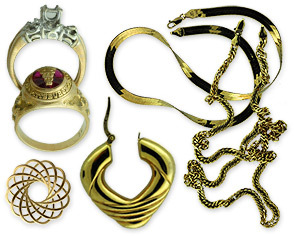 Tangled or incomplete jewelry is fine too. 650-GOLD is one of Cleveland's top estate jewelry buyers, with decades of experience you can trust. For a confidential consultation, please call our estate buying department at 216-650-4653.